"Courage means rising up to defend your beliefs... or daring to question them. I can’t believe I didn’t read this when it first released, but I am so glad I have rectified that situation. Tammara Webber is such an incredible writer and her books always strike such a chord and deliver. Brave is a bit different from the previous books in this series. To me it felt much more like Erin’s story rather than Erin and Isaac’s story. Erin really comes into her own over the course of this novel and the story was very much about her growth and how she comes to terms with herself and her life and learns what she wants. I absolutely loved Erin. She was fierce and determined and hardworking. She’s taken a bit of a sidestep in the path she thought she would follow, but she doesn’t let that stop her and she still puts her all into everything she does. I truly admired that about her. I also loved that she knew herself and she knew what she wanted and wouldn’t settle. She may be a bit off track in some ways, but she doesn’t let it stop her and she keeps going until she gets back on track. And even though I thought this was Erin’s show, that didn’t mean I didn’t love Isaac. Isaac is a quiet character, but when he speaks you listen. He is incredibly smart and hardworking and you have to admire that. He is put in a very difficult situation of being the boss of the owner’s daughter and he handles it well. He’s just a good guy and I really loved him. The romance between Isaac and Eric is such a slow burn and I loved it. They grew together slowly and over time and I loved watching them slowly open up to one another. When they first meet one another they do not get off to the best start, but it’s clear they have more in common than they first thought. Slow burns when executed right can be the best and this was executed perfectly. I also loved the social commentary that was woven into the story. She handles topics that are very relevant today and shows that you should stand up for what you believe in and not let the things that matter slide. 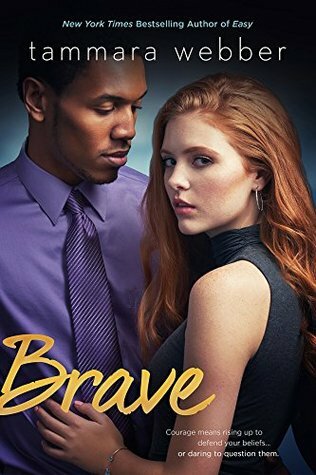 Brave was another fantastic read from Tammara Webber. All of the books in this series are some of my very favorite reads. These are the kind of New Adult reads we need and is what I think the genre was always intended to be: finding yourself and growing from a teenager into an adult and finding that adult you want to be along the way and you know if there’s some romance to be found there too, that doesn’t hurt. This is the kind of book that made me fall in love with the New Adult genre to begin with and it was so great to find another book like that once again. All in all, Brave was a wonderful read and I loved every single second of it. I've only read Easy and I loved it. I've heard nothing but great things about Webber though! I love a good slow burn romance great review! All the stuff I've read from her has been great, she never disappoints!